UPDATE: July 22nd - Due to time constraints - the NRL Injured List will not be updated again this season. As much as we want to continue to provide this service - having missed updating it through the Origin period - it is just too much work to get back up to date when we can't guarantee we can keep it updated every week for the rest of the season. That all said - www.wdnicolson.com will continue to post Tips but no Late Mail will be available for the rest of the season, sorry. This is the 4th season of the most comprehensive and up to date NRL Injury and Suspension List available on the internet. This page is updated regularly every Tuesday evening after Tuesday Team Lists (and most of the time injuries suffered on the weekend are added on Monday) - so bookmark this page and do yourself a big Fantasy and Tipping favour for the rest of the season. Our sources are Official NRL Club Sites (links available below), various media reports and most importantly - our weekly game observations - which set this list apart from anything else you can find. Means a player should play this coming Round but may still miss the game due to a niggling injury or recently diagnosed 'short term' injury. Means a player is extremely unlikely to play within the next 2-4 weeks or again this season - due to a long term injury/suspension, but beware players sometimes do return out of nowhere. It happens. NOTE: We usually have an ETA (Estimated Time of Arrival back in First Grade) but please note it is a GUIDE, not an ironclad date of return. Now www.wdnicolson.com will endeavour to update the NRL Injured List regularly during each week of the season, making it an invaluable Fantasy and Tipping Tool alongside our Weekly NRL Previews, but we can't promise that it will be updated daily during all 26 rounds. Remember all updates post Wednesday night go into the Round's Late Mail on the front page of www.wdnicolson.com and track our Twitter Account for game-day updates. Please note: this is a guide, while we don't publish hearsay and unfounded rumours, not every player listed will definitely miss a game (or play) just because he is listed here. Can't find a player here or on the main NRL team lists? # TEAM NOTES: See Late Mail for Round 13 out Wednesday night. Sam THAIDAY - Calf | Named for Round 13. Justin HODGES - Ankle | Named for Round 13. Andrew McCULLOUGH - Groin | Named for Round 13. Mitchell DODDS - Knee | Done for Season 2014. Shaun FENSOM - Elbow | Named for Round 13. Anthony MILFORD - Knee | Named for Round 13. Joel EDWARDS - Cheekbone | Not named for Round 13. Josh PAPALII - Ankle | Named for Round 13. Shannon BOYD - Sternum | Named for Round 13. Edrick LEE - Foot | Injured in Round 3 - Out for most of the season. Jeff LYNCH - Knee | Pre-Season Injury - Season over. Tim LAFAI - Hand | Named for Round 13. Chase STANLEY - Wrist | Named for Round 13. Moses MBYE - Foot | Injured in Round 11 - Round 18-20. Josh MORRIS - Knee | Injured in Origin 1 - Round 18-20. Frank PRITCHARD - Pectoral | Injured in Round 6 - Season likely over. Todd CARNEY - Hamstring | Not named for Round 13. Sosaia FEKI - Hamstring | Not named for Round 13. Beau RYAN - Neck | Not named for Round 13. Jonathon WRIGHT - Hamstring | Not named for Round 13. Ricky LEUTELE - Knee | Not named for Round 13. Jeff ROBSON - Hamstring | Not named for Round 13. Paul GALLEN - Ankle | Not named for Round 13. Luke LEWIS - Neck | Named for Round 13. Eric GROTHE - Back | Not named for Round 13. Anthony TUPOU - Ribs | Not named for Round 13. Andrew FIFITA - Wrist | Not named for Round 13. Matt PRIOR - Knee | Not named for Round 13. Albert KELLY - Leg | Named for Round 13. Luke BAILEY - Ankle | Named for Round 13. William ZILLMAN - Hamstring | Named for Round 13. Ashley HARRISON - Neck | Not named for Round 13. Luke DOUGLAS - Thumb | Named for Round 13. Ryan JAMES - Shoulder | Named for QLD Cup. Beau FALLOON - Knee | Not named for Round 13. Matt SRAMA - Shoulder | Named for Round 13. Ben RIDGE - Knee | Named for Round 13. Caleb BINGE - Shoulder | Named for QLD Cup. Brad TIGHE - Shoulder | Named for Round 13. Aidan SEZER - Pectoral | Injured in Round 10 - season likely over. Jamie DOWLING - Knee | Injured in QLD Cup Round 1 - Season over. Anthony WATMOUGH - Bicep | Named for Round 13. Kieran FORAN - Knee | Named for Round 13. Daly CHERRY-EVANS - Hip | Named for Round 13. Jamie LYON - Knee | Named for Round 13. Glenn STEWART - Ankle | Not named for Round 13. Brett STEWART - Hamstring | Named for Round 13. Jason KING - Pectoral/Groin | Named for Round 13. Steve MATAI - Foot/Head | Named for Round 13. Jorge TAUFUA - Shoulder | Named for Round 13. Tom SYMONDS - Back | Named for Round 13. Cameron SMITH - Ankle | Named for Round 13. Justin O'NEILL - Leg | Not named for Round 13. Billy SLATER - Shoulder | Not named for Round 13. Sisa WAQA - Ankle | Named for Round 13. Cody WALKER - Hamstring | Not named for Round 13.
Cooper CRONK - Arm | Injured in Origin 1 - Round 20-26. Matt DUFFIE - Knee | Pre-Season Injury - Season Over. Kurt GIDLEY - Head | Named for Round 13. Kade SNOWDEN - Head | Named for Round 13. Jarrod MULLEN - Hamstring | Named for Round 13. Beau SCOTT - Abdominal | Named for Round 13. Akuila UATE - Ankle | Named for Round 13. Jeremy SMITH - Knee | Not named for Round 13. Adam CUTHBERTSON - Knee | Injured in Round 12 - Round 18-22. Alex McKINNON - Neck | Injured in Round 3 - confirmed broken C4/5 in his neck. Long term prognosis tba but his career is over. Pray for him. Clint NEWTON - Pectoral | Pre-Season Injury - Season all but over. Jason TAUMALOLO - Ankle | Named for Round 13. Kane LINNETT - Back | Named for Round 13. Antonio WINTERSTEIN - Hamstring | Named for Round 13. Hezron MURGHA - Knee | Named for QLD Cup. Tariq SIMS - Suspended | Returns in Round 14. Gavin COOPER - Knee | Injured in Round 10 - Round 22-26. Patrick KAUFUSI - Pectoral | Injured in NYC - Season over. Lachlan COOTE - Knee | Pre-Season Injury - long long shot of being back for Finals. Jarryd HAYNE - Shoulder | Named for Round 13. Willie TONGA - Ribs | Named for Round 13. Manu MA'U - Ankle | Named for Round 13. Kaysa PRITCHARD - Knee | Named for NSW Cup. Kenny EDWARDS - Hand | Named for Round 13. Jacob LOKO - Knee | Not named for Round 13. Lee MOSSOP - Shoulder | Named for Round 13. Nathan PEATS - Knee | Injured in Round 12 - Season over. Mitchell ALLGOOD - Suspended | Returns in Round 15. Nigel PLUM - Head | Named for Round 13. Tim GRANT - Calf | Named for NSW Cup. Jamie SOWARD - Back | Named for Round 13. Sika MANU - Shoulder | Named for Round 13. Shaun SPENCE - Knee | Named for NSW Cup. Dallin WATENE-ZELEZNIAK - Foot | Named for Round 13. Elijah TAYLOR - Knee | Named for Round 13. Lewis BROWN - Pectoral | Named for Round 13. Wes NAIQAMA - Ankle | Named for NSW Cup. Tom HUMBLE - Ankle | Named for NSW Cup. Jamal IDRIS - Personal | No time frame is set for his return. George JENNINGS - Elbow | Pre-Season Injury - Season likely over. Sam BURGESS - Elbow | Named for Round 13. Alex JOHNSTON - Quad | Named for Round 13. Joel REDDY - Knee | Named for Round 13. Issac LUKE - Shoulder | Named for Round 13. Thomas BURGESS - Foot | Named for Round 13. Luke KEARY - Pectoral | Not named for Round 13. Jason NIGHTINGALE - Knee | Named for Round 13. Dylan FARRELL - Pectoral | Injured in Round 6 - will miss most of the season. James MALONEY - Shoulder | Named for Round 13. Remi CASTY - Leg | Named for Round 13. Tautau MOGA - Knee | Named for NSW Cup. Konrad HURRELL - Shoulder | Named for Round 13. Glen FISIIAHI - Shoulder | Not named for Round 13. Dane NIELSEN - Ankle | Named for NSW Cup. David FUSITU'A - Shoulder | Named for Round 13. Jayson BUKUYA - Toe | Named for Round 13. Thomas LEULUAI - Groin | Not named for Round 13. Kevin LOCKE - Knee | Named for NSW Cup. Ben HENRY - Knee | Not named for Round 13. Dominique PEYROUX - Head | Named for NSW Cup. Jerome ROPATI - Jaw | Injured in Round 4 - Retired. Braith ANASTA - Ankle | Named for Round 13. Liam FULTON - Head/Shoulder | Named for Round 13. David NOFOALUMA - Knee | Named for Round 13. Curtis SIRONEN - Toe | Named for Round 13. Sauaso SUE - Ankle | Named for Round 13. James GAVET - Hamstring | Not named for Round 13. Robbie FARAH - Elbow | Named for Round 13. James TEDESCO - Ankle | Named for Round 13. Dene HALATAU - Ankle | Named for NSW Cup. Tim MOLTZEN - Knee | Pre-Season Injury - Round 14-18. Did we miss any injuries? 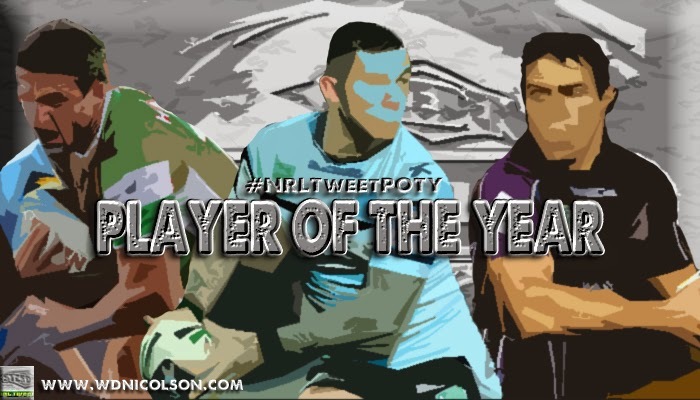 Can Johnathan Thurston defend his 2013 @NRLTweet Player of the Year Award in Season 2014? The Prestigious Award returns for a 5th Season and we're looking for more voters to take part in arguably the most objective Player of the Year Award around. Tallied Votes for every 4 Rounds are available on www.wdnicolson.com at the start of every month.